TreeTops True Stories are exciting, motivating non-fiction books which will broaden your pupils' reading experience. They are part of a structured reading programme for juniors. This story is woven together from the account given in Ludwig Leichardt's journal of his crossing from the Darling downs near Sydney to Port Essington, near Darwin in 1844. 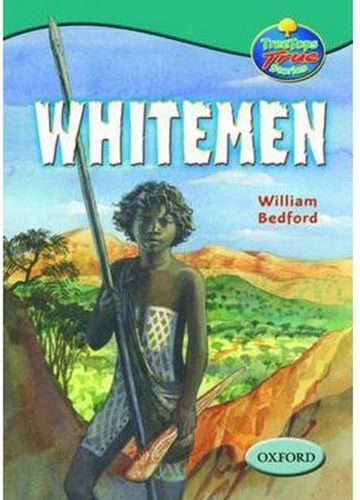 The account however is fictionalised and told from the perspective of a young aboriginal boy and his grandfather who accompany Leichardt on part of the journey - hence the stark title of Whitemen - Explorers in a Strange Land. The author captures the suspense and drama, and manages to empathise convincingly with the aboriginal characters who find many of the whitemen's ways so strange and impractical. Books contain inside cover notes to support children in their reading. This book is also available as part of a mixed pack of 6 different books or a class pack of 36 books of the same Oxford Reading Tree level.